EDMONTON, Jan. 9, 2018 /CNW/ - Altiplano Minerals Ltd. (TSX-V:APN) (OTCQB:ALTPF) (FWB:9AJ1) ("APN" or the "Company") is pleased to report underground sampling results of the 395M Level at the historic Farellon Copper-Au Mine, La Serena Chile. Between late November and through to the end of December of 2017, APN developed a 46m horizontal drift along the Cu-Au-Fe Farellon vein system where approximately 1,250 tonnes of vein material was extracted from the drift, which is located at 395 meters above sea level (Level 395). The vein width ranges between 2m and 2.9m and exhibits magnetite- and chalcopyrite-rich bands. Systematic channel chip sampling was completed every ~3m along the length of the 46m drift. Samples were collected perpendicularly across the vein making channels of ~5cm wide and ~2cm depth using a diamond saw. Typically, three continuous samples were collected at each sampling site to sample separately magnetite- and chalcopyrite-rich bands. Results of sampling composites are shown in Table 1. The high-grade composites (1.38–5.58% Cu, 27.27–54.94% Fe, and 0.04–0.34ppm Au) varies in width from 1.09m to 2.25m and include intervals of 0.5m with up to 10.3% Cu. The Company will be working with its staff and contractors to determine the optimum grade-width as part of the initial 2,000 tonne bulk sample program. A second larger 5,000 tonne bulk sample program will follow to fine tune company procedures to assess next steps. Figure 1 below shows the underground sample locations and diamond drilling that exists at or near the drift completed in 2017. The underground channel samples were analyzed at the analytical laboratory Actlabs in Coquimbo, Chile. Approximately 1 in 10 QC samples (standards, blanks, and duplicates) were inserted into the sample sequence, additionally to the Actlabs internal QA/QC for analytical procedures. The results show an acceptable level of analytical precision and accuracy. Figure 1: Geology Map of the 395m Level Drift Showing Sample Locations. CEO John Williamson stated, "Our initial results of the 395M drift chip sampling are higher grade and wider than our early estimates from historical work. Our target is to deliver mineralized material greater than 2% Cu for toll milling. We are also investigating the possibility of upgrading the Cu concentrate on site and separation of an Fe concentrate for potential sale. 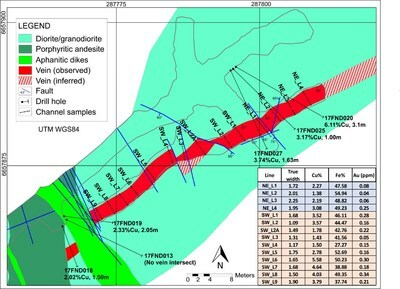 The underground drift sampling clearly shows the potential for higher grade Cu-Fe-Au mineralized vein system." As part of its ongoing program, APN is carrying out the recommendations contained in the APEX Report of February 10, 2017 filed on SEDAR for the exploration development of the Farellon project and is also relying upon past production records, underground sampling and related activities and current diamond drilling to estimate grade and widths of the mineralization. There are no mineral resources or reserves on the property and the current mineral exploration activities are intended to be part of a program to determine if mineral resources can be identified. Osbaldo Zamora Vega, P.Geol., Vice President of Exploration for Altiplano, is the Qualified Person as defined in National Instrument 43-101 who has reviewed and approved the technical contents of this press release. Altiplano Minerals Ltd. (APN: TSX‐V) is a mineral exploration company focused on evaluating and acquiring projects with significant potential for advancement from discovery through to production, in Canada and abroad. Management has a substantial record of success in capitalizing opportunity, overcoming challenges and building shareholder value. Additional information concerning Altiplano can be found on its website at www.altiplanominerals.com.